Economize R$ 173,28 (87 %). Comprar eBook Kindle. Advanced Apex Programming for Salesforce.com and Force.com is neither a tutorial nor a book for beginners. Intended for developers who are already familiar with the Apex language, and experienced Java and C# developers who are moving to Apex, this book starts where the Force.com documentation leaves off. Instead of trying to cover all of the features of the platform, Advanced Apex programming focuses entirely on the Apex language and core design patterns. You'll learn how to truly think in Apex - to embrace limits and bulk patterns. You'll see how to develop architectures for efficient and reliable trigger handling, and for asynchronous operations. You'll discover that best practices differ radically depending on whether you are building software for a specific organization or for a managed package. And you'll find approaches for incorporating testing and diagnostic code that can dramatically improve the reliability and deployment of Apex software, and reduce your lifecycle and support costs. Based on his experience as a consultant, Salesforce MVP and architect of major AppExchange packages, Dan Appleman focuses on the real-world problems and issues that are faced by Apex developers every day, along with the obscure problems and surprises that can sneak up on you if you are unprepared. This third edition contains updates through Summer 15 (API 34) along with significant new content on asynchronous design patterns, optimization and maintaining Apex applications. Comece a ler Advanced Apex Programming for Salesforce.com and Force.com no seu Kindle em menos de um minuto. Dan Appleman is a well known author, software developer and speaker. Currently the CTO of Full Circle Insights and a Salesforce MVP, he is the founder and CEO of Desaware Inc., one of the co-founders of APress publishing, and is the author of numerous books and ebooks on various topics (technology and other). 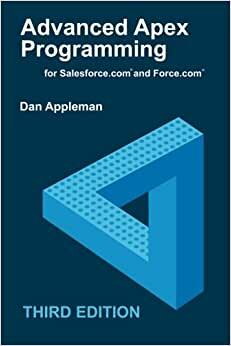 This is a phenomenal book in terms of the amount of practical and applicable knowledge that you immediately can use in developing for the SalesForce platform. The author has put together an impressive amount of content in the book and the early chapter on triggers was exceptional. He offered a lot of great code samples that build up over the course of the chapter. 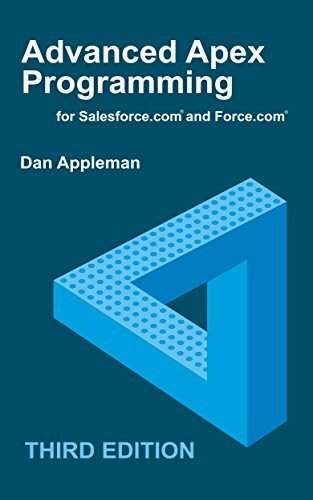 I found this book to be a great resource for those that have some experience with Apex and SalesForce development already. If you are completely new to Apex and SalesForce then I would encourage you to use Trailhead from SalesForce to get some entry level knowledge and then use this book to take you to the next level. 4,0 de 5 estrelasWell explained principles for developing on the force.com platform. If you are a salesforce developer, you must get this book. This is worth every penny, especially if you are developing on the force.com platform. I use this book often to understand Apex. Still new to the interface. Once I become more familiar I update my review but for now it’s giving me the basics to get started and then some! 5,0 de 5 estrelasBest Apex Resource I Have Found Yet! This is the best Apex resource I have found yet! It has provided me with the information to make some really important changes for my company! I would buy this book again in a heartbeat!